This weather station provides readings from various parameters including barometric pressure; inside and outside temperature; inside and outside humidity; dew point; rainfall for minutes, hours, days, month, year, and particular storm; wind direction and speed, and the time and date. The integrated sensor suite runs on solar power, which provides enough power to run the unit on as little as one hour of sunlight per day. 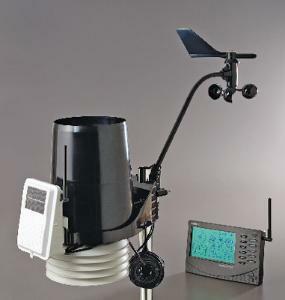 The anemometer is detachable for ultimate flexibility. You can mount it with the integrated sensor suite or mount it separately using the included 40' cable. The rain collector is exceptionally accurate and has a self-emptying tipping bucket, and the temperature and humidity sensors are located inside the radiation shield. The set includes the console, integrated sensor suite with transmitter, solar panel, 40' anemometer cable, and mounting hardware. The console may be powered with the included AC-power adapter or with three C batteries, available separately. Batteries will last up to one year under normal conditions. Range: 1,000' line of sight, under most conditions 75–150'. Console dimensions: 11 "L x 9 3/8"H x 1 5/8"D. Integrated sensor suite size: 11"L x 9 3/8"W x 14"D.
The Wireless Vantage Pro2 Plus (232001) weather station includes two additional sensors that are optional on the Vantage Pro2 (232000): the UV sensor and the solar radiation sensor.